There is a first challenge that one executes to the best of their ability and in doing so, improves. I have always preferred to those kinds of recipes that we can take elements from, transform, be inspired by, interpret and leap from, freely. I have put effort into research for recipes from the regions and always respect a classic recipe when its the first time I follow it, but I've also come to a certain pleasure in not using a recipe at all, or just being inspired by one. Baking involves following the rules, all the time. 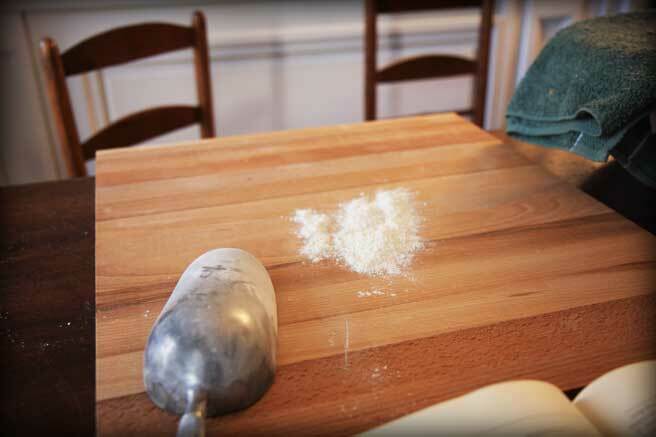 Every time I've been tempted to stray while baking, I ended up with a big mess on my hands. For a time, I convinced myself that baking was fussy. But I think that was a defense mechanism. To give me an excuse for the failed birthday cakes. I have got to get over it. 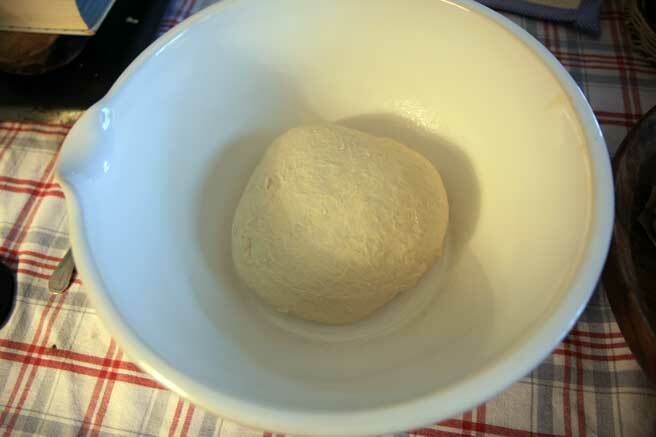 In embarking on these challenges with the Daring Bakers, I face the truth and seek to master a certain fear. Everyone must face the fear of failure, and push through it in order to grow. In many ways, life happiness depends on our ability to push through it. 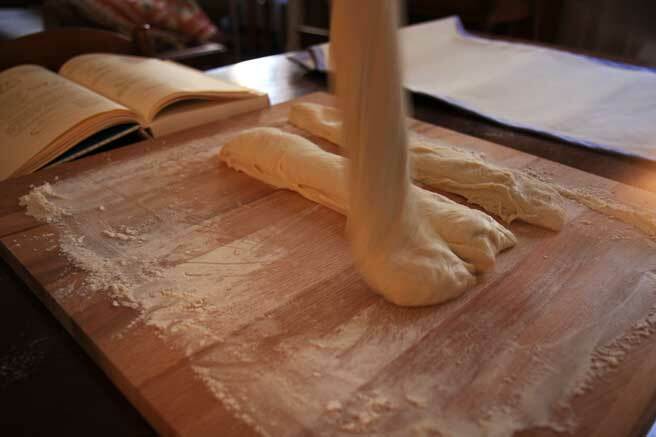 Pastry is a vocation that actually serves the perfectionist well. If you learn the specific properties of the materials you are working with, how they react to heat and cold, and if you respect them, you can do great things with pastry. If you embrace the rules of the game and spend the time to follow recipes, you still end up victorious. If you can't, you go to the corner bakery or the grocery store and purchase your pastry. Loic proposed marriage to me on July 3, 1999. I responded yes, with a condition. That he go to America and live as a foreigner for one year before we made the move to France. There had been some talk, I had an inkling that it might not be easy. I had lived in foreign countries before. The difference this time was that I had never moved to a foreign country to live there for the rest of my life. Expats and immigrants have different experiences. I had this idea that any culture shock I endured in France might resonate more deeply this time. I wanted him to understand. So we worked it out, and he chose the city in America, as agreed, where he could experience life together with him as a foreigner, just in case he needed to understand what it was like, you know. He got a post in a research team at UCLA and we made the move. He came home to our studio with loft across from the UCLA campus, the one with the dingy whisper of spillover frat parties past and a strong undertone of carpet cleaner that never went away, with a book, in French. It was one that explained the science of bread. The thing he missed the most was the bread. He simply could not make do with what we had available then. At the time, I had spent some time studying in Paris, but not long enough to develop a corporal need for fresh daily bread. 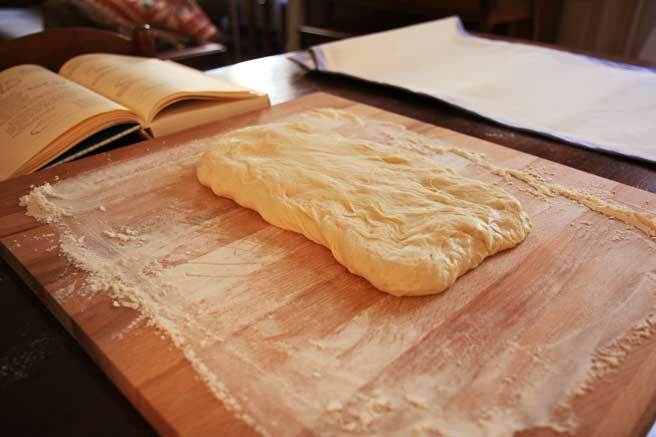 Since the air, the water, schedules and budgets could not provide, he began to make his own bread at home. He kept a large lab book within which he silently noted all of his experiments. He raised levain in a white jar we got at the dollar store, that he kept on top of the refrigerator, carefully tended to and observed. He spent time executing different loaf making techniques. He rolled out of bed before dawn every day to form the loaves and we had hot bread with coffee before I donned my pantyhose, put on my suits and hit the traffic on the 405 in my dinged up 1990 silver Toyota Corolla to bring home some bacon. Honestly, I had no involvement in the bread making at all back then. None. I wasn't even interested in it. You had to get up too early. 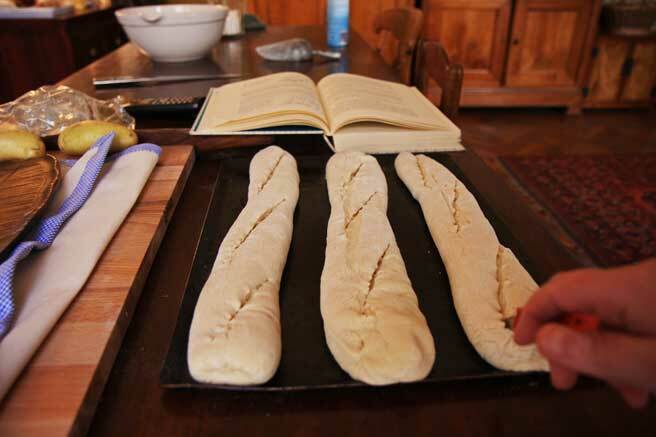 He was the man and he made the bread with a book in French. I just ate it in the mornings and loved him. He never even talked about it. We eventually came to France and embraced the boulangerie tradition, by choosing our bakery and proclaiming our fidelity to the one we loved the best. I didn't love Loic any less when he stopped making bread, of course. In a flash in my mind's eye, I have something that seems like a memory but I know hasn't happened yet. Simple living in a small town somewhere in New York. Maybe in a college town, with lots of books, dark wood, deep snow outside. 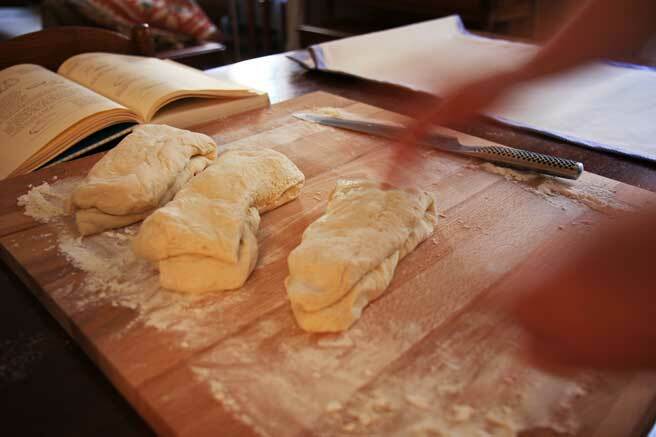 And French bread baking. It's just an illusion. Just a composition of memories and hopeful emotions tinged with the remorse that comes with missing family. We do have vacations there from time to time. We may be in the need for French bread here and again. This task is quite important to learn, then. The Daring Baker's Challenge recipe this month was to follow exactly from Julia Child's Mastering the Art of French Cooking, Volume II, pages 57-74, her recipe for French Bread. You can do this at home. Don't be afraid. It is really quite liberating. This challenge was hosted by Sara at i like to cook and breadchick at The Sourdough. To see the results from my fellow Daring Bakers, click here. Wow. Magnifique! And a lovely post. Rillettes et saucisson? c'est une tuerie ton pain!! Quelles merveilles tes baguettes! Your bread looks fabulous, but your pictures are even more fabulous. You are an inspiration! Gosh this is remarkable! So dedicated and so beautiful! Your bread looks wonderful. I love how you ahve got the slashing effect so perfect. beautiful! !im really speechless with your french bread!! magnificent job for this month's challenge!! Oh, I am jealous about you couche, which made such great French Breads. Wow- the bread looks amazing. Great blog too! Amazing exposition of the recipe!!! I didn't visit your Beautiful blog, it've stun me! P.s. But How do you had make it? I love your story and I love your pictures. I will come around more often, your blog is beautiful, too. Oh my God, your pictures are absolutely gorgeous. Don't get me started on the yummy crunchy looking bread. Authentic french touch! Well done you! What gorgeous photography! That first photo looks like it could be the cover of Gourmet magazine! Perfect! You've been here all this time and I had no idea...I'll be back. Wow! I'm impressed. Great pictures! Great story! Great bread! Thanks for sharing. 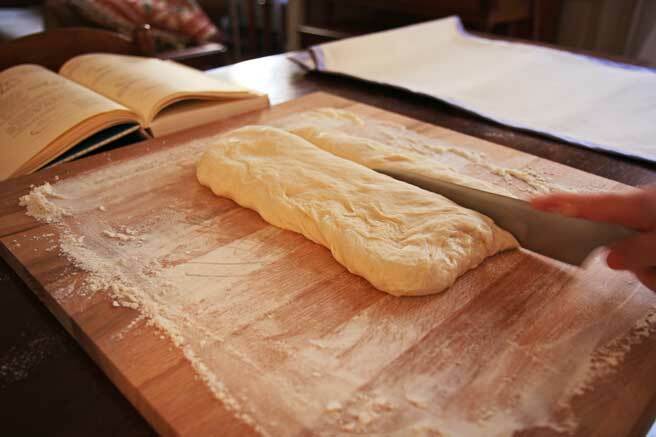 What a great story to accompany some lovely looking bread! Thanks Lucy for the wonderful story! 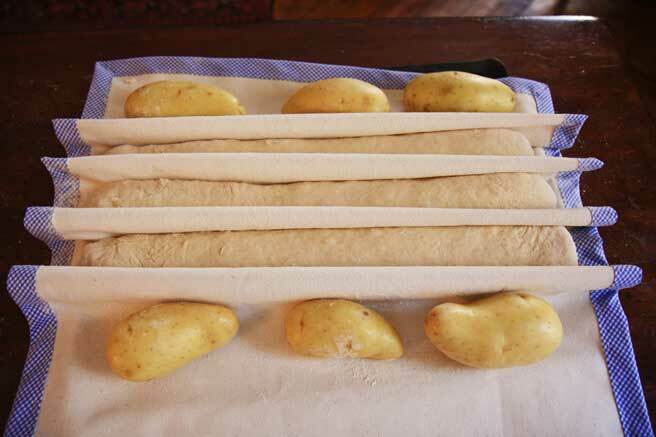 i used to bake french bread and it's been years since I've done it and now I'm inspired to get baking! Such beautiful loaves and photos! I could take a bite of that lovely bread right now! Your other posts are gorgeous, too. I love the way you told a story with both pictures and words. Your bread looks amazing and I wish I could have some right now. 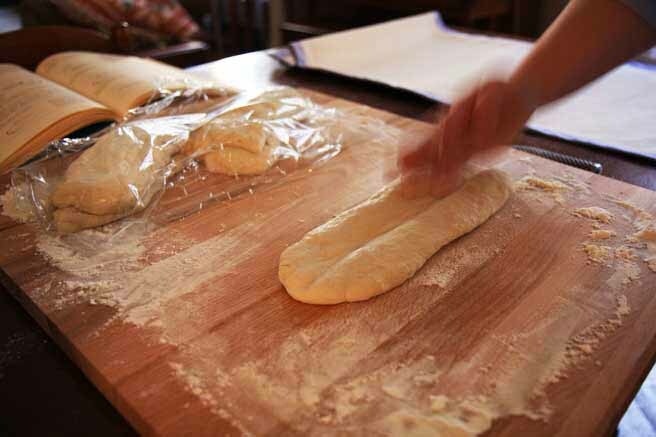 Your story and photos make a beautiful homage to good fresh bread. I loved it. I loved reading your story--like your bread, so much love and history! A perfect celebration of the simple but so-important aspects of life. And, naturally, Gorgeous Loaves. Amazing story and your loaves look fabulous! 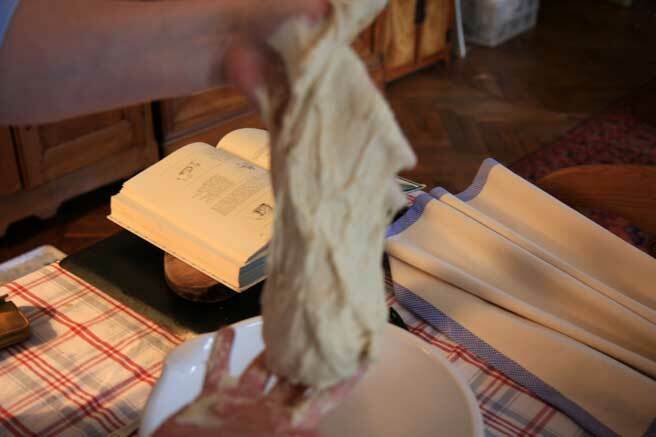 a lovely post and gorgeous photos, not to speak about the bread! 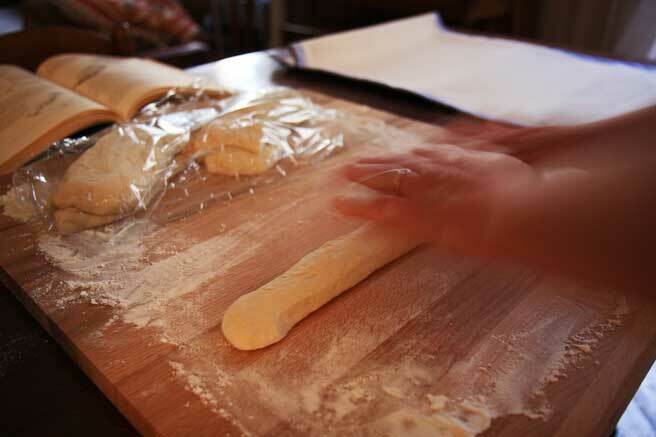 Oh, how I wish I had seen your step-by-step photographs before doing my bread. They would have been very helpful. Your bread looks gorgeous. Hello Lucy, Such beautiful bread! Lush and crusty looking. And what a lovely blog too. I attended a bread course only yesterday by Richard Bertinet. To say the least it was excellent. He spent about 20 minutes explaining why bread is everything to the French. Your poor husband! But I think he must be pretty wonderful to learn to bake what he missed so dearly. Thank you for your flattering comments on my blog. Cheers! Wow. Your bread is gorgeous! Such a lovely post, too. And the photography is amazing! The baguettes are golden to perfection! 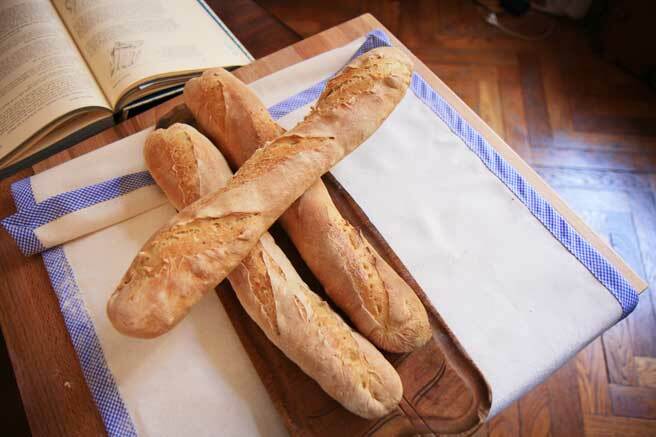 Those Baguettes looks perfect! Well done! Thank you for sharing such a lovely story. 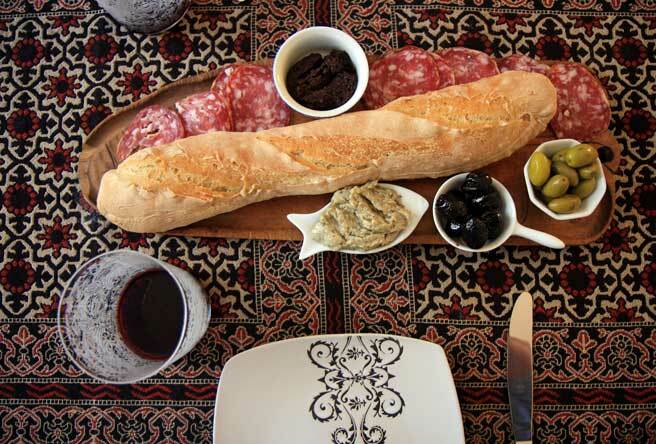 Your bread as well as your photos are simply beautiful! WOW! Those look just perfect! Your loaves look fantastic! You have such beautiful pictures too. Beautiful bread and a lovely story! I am just so impressed with everything here. Your blog (writing, layout, images) is a work of art. Absolutely beautiful and I loved all of your pictures. I ended up making the round loaves because I got intimidated during shaping. I will definatley be back to see how you did it when I try the recipe again! Your blog is beautiful (I am having a total blog envy fit right now!). Love it! What a great story, and your pictures are beautiful.! A wonderful post, and lovely bread. Love that last photo. Well done with the bread making, I hope that Loic was suitably impressed. I'm blown away by the post, the blog, the bread.My first visit and I will be back! Beautiful bread and a beautiful story. I am going to have to teach my boyfriend how to make this bread so that I too can rise to the smell of French bread baking. That or I'm moving to France! I spend quite a bit of time cooking and writing. I love both, and this fact leads me to search relentlessly for others who do the same. This story, your site, the writing is like a breath of fresh air. Quite enjoyable...and the bread is outstanding, of course! Gorgeous post as well as bread! Love your photos as well! Beautiful, I love your photos! And the rillettes, saucisson and olives are making me droooool. Beautiful photos, wonderful writing. I think I am really going to like your blog! Congratulations on becoming a daring baker! Great story, and beautiful bread! Excellent job Lucy! Lucy, Thank you so much for leading me to your blog! I loved all your stories and beautiful photo's. I'll be back, for sure!! Stunning! I loved all the photos. 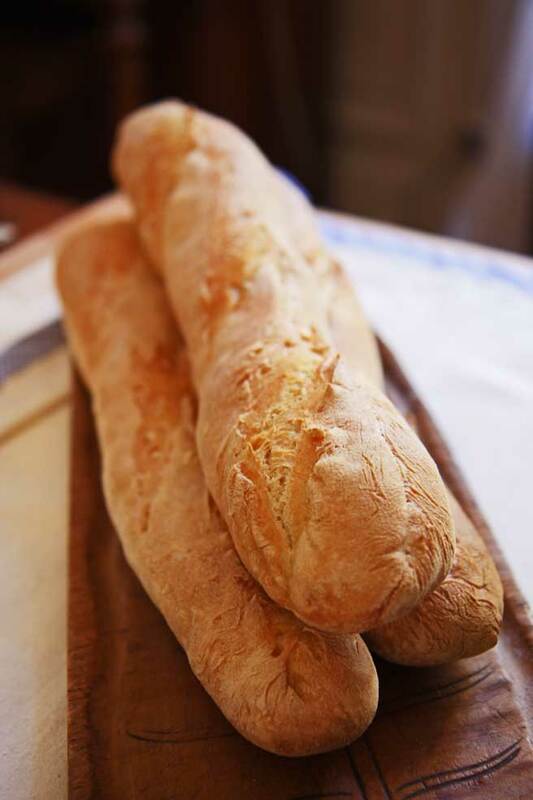 The baguettes are picture perfect. i loved reading your blog. it was so personal unfolding both your life and your bread! excellent! A very enjoyable post to read and may I also say what a beautiful blog in style and presentation you have?! 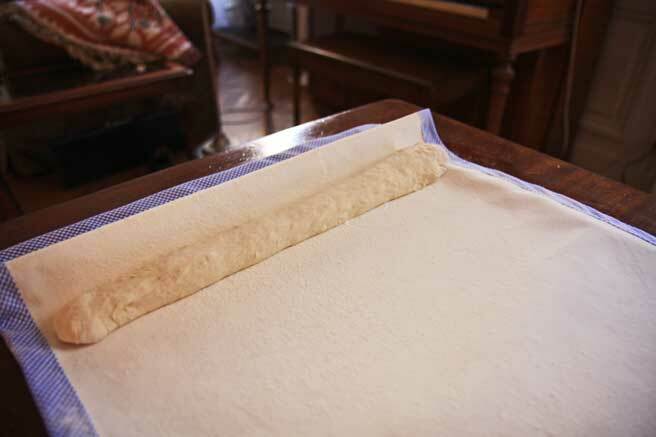 Your bread is gorgeous and I am coveting your couche- I used plain canvas. Glad to see you on this challenge! Wow, Lucy, your pictures are beautiful! I ended up not posting any of my pictures of the "process" since I always seemed to make the dough look like a grayish blob, but yours are fantastic. je suis ravie de découvrir ton blog via ce challenge ! Tu racontes merveilleusement bien ta vécu à cette période, et tes photos sont vraiment formidables. Ton pain est très très très réussi ! Bravo !!!!! THANK YOU ALL for all the nice comments! WOW! Ulriche and Gabi, I decided to pick up a nice heavy piece of canvas, and at checkout they had the trim on sale. 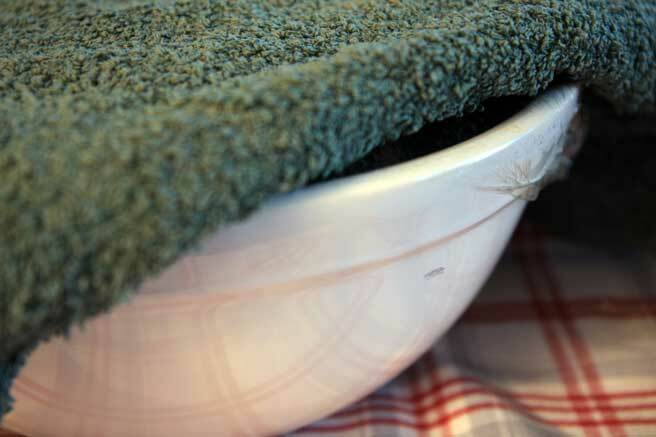 I sat and thought about making the bread and bread in general that evening while I sewed on the trim. I had never seen a "baking canvas" before but I imagined it might look like that. Thanks everyone, I never had so many comments before! Wow! 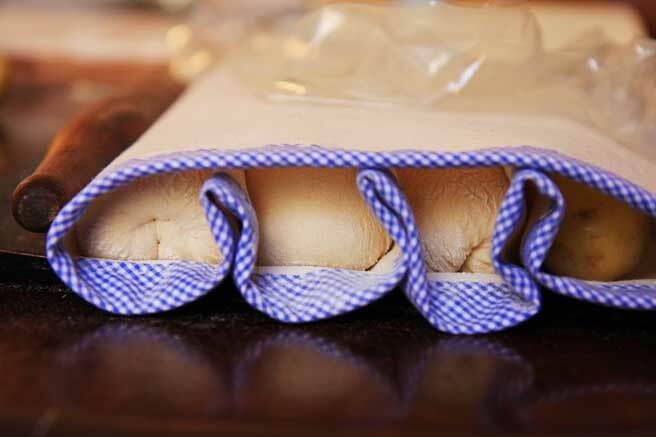 Lovely loaves, and what a great series of pictures to accompany your post. I hope you were able to enjoy your bread as if it really had come from a boulangerie. Wow! I'm drooling at your fantastic photos! Beautiful bread and so nicely photographed! Great job. Beautiful! Looks beautiful! And wonderful photos. Lovely. ;) so I left my last comment on the wrong post! But I'm happy now to add I loved your bread board and your canvas. I had a lovely story made up that it was your grandmother's ;)) now I see you made it! My sister gave me the board a couple of years ago. I use it all the time! 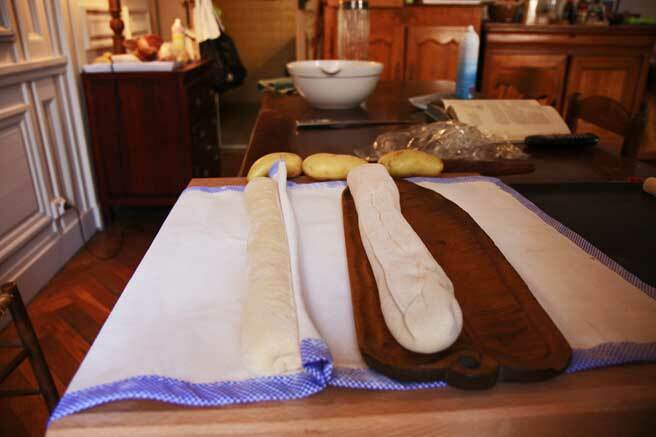 Your photos of the bread/process are fascinating! Definitely some of the best I've seen. Beautiful. Wow! Your pictures are truly art. I love how your photos offer a storyline all on their own. wow, what a wonderful story! you did a marvelous job w/the challenge! Maria, I'm the one baking now, he just eats it these days! We've never baked together, we'd probably step on each others toes! I fell in love with your baker's canvas! What a gorgeous story and labor of love on both sides of the Atlantic. Your bread is wonderful. Thanks so much for joining Sara and I this month and for truly being a Daring Baker. Thank you for your comments on my site! I truly enjoyed my first DB challenge and am looking forward to many more. Your site is absolutely beautiful and very inspiring. Fantastic job on the bread (wasn't it delicious??). Wow! What an awesome post. I'm glad that you were able to try the bread that your husband loves. You pictures are beautiful. When were you in Bishkek? Lucy, thanks for sharing your husband's experience moving to the states. I find that after family, food almost always becomes the thing we most strongly identify with our previous experiences, and thus miss the most. On a side note, as a completely computer illiterate person, can you tell me how you mess with your picture sizes? My email is spackysgirl AT hotmail DOT com. Thanks! I loved your story and enjoyed your writing. The accompaniments you chose are fabulous. Lucy- Your bread is beautiful and your story is lovely! Your husband sounds like a gem. I love your step by step photos. I always get so caught up in the recipe that, half the time, I forget to take the pictures! Your bread (and I enjoyed reading the write up) is so beautiful that I have decided that I shall give this recipe one more try some time. 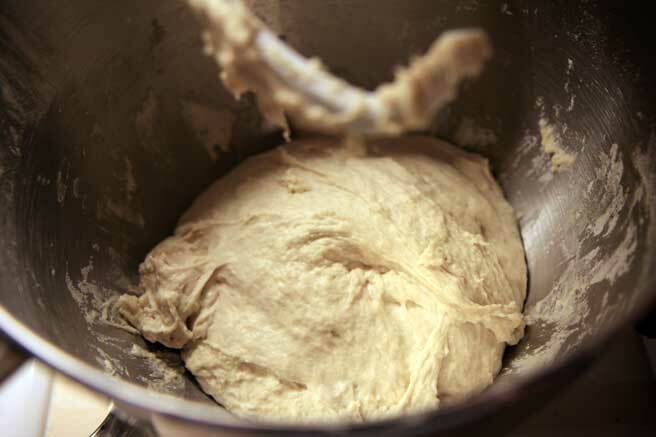 thanks for sharing the story, and your breads is gorgeous! I love the use of the potatoes...very clever! Beautiful bread! I don't think I could get my husband to bake bread, no matter how much he wanted fresh bread in the mornings! Your photos are gorgeous and your finished bread is lovely! Beautiful pictures and a great way to serve it. Bravo! You take such beautiful pictures! The bread looks great! I love the way your bread looks! You did a great job forming the loaves. Your bread is beautiful and I love your process pictures. 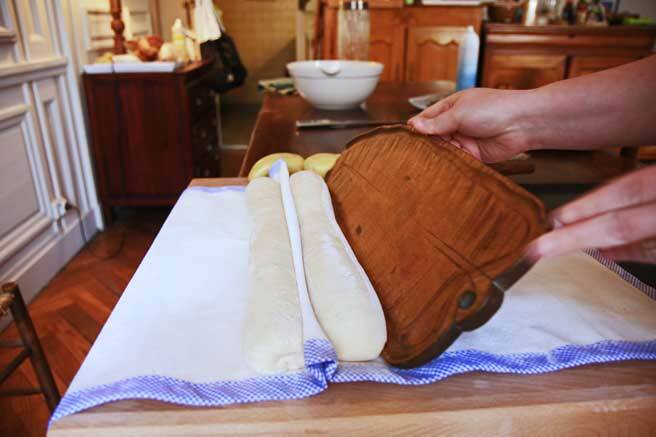 How wonderful that you now know how to make French bread whether you need to or not. Your bread looks completely wonderful. 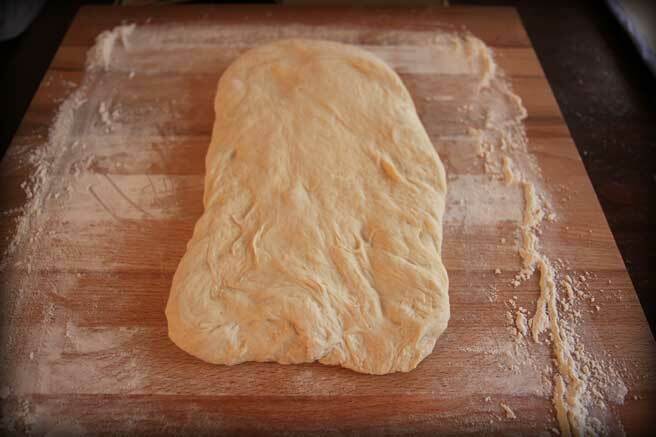 What a great crust and i love the photos. Thanks for your comments too. Great post, great pictures, great bread! Stunning bread and great pictures! 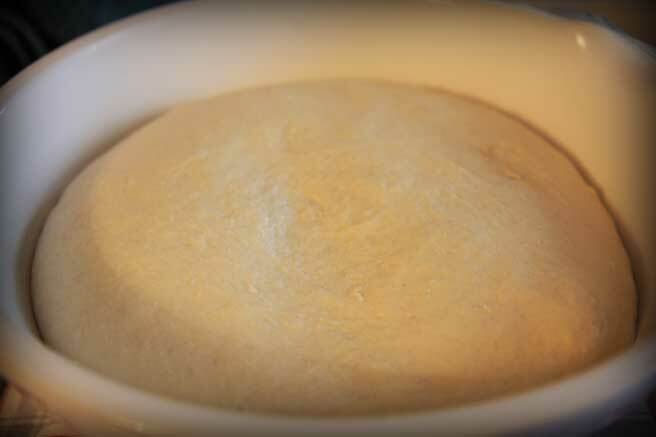 There is nothing more rewarding, to me, than baking my own bread, and I never find time to do it any more, but this has certainly inspired me to get baking again. Love the big white bowl with the pour spout in the pic. Wonder where I could find one of those in the states? Michelle, I believe that bowl came as part of a 3-bowl set at K-Mart, circa 1999. What a truly wonderful post! Lucy, absolutely incredible post; the "dual" story-line was brilliant and it made the pictures that much more meaningful. I am in love with your baking equipment!